Our exquisite hand-cast sterling silver and hand-worked glass charms are created one by one by skilled professional jewelry artisans. That's why you can count on quality and value from Thin Line® Jewelry. We offer affordable shipping, a 100% customer satisfaction guarantee, and a top notch customer service team. Fits Pandora, Biagi, Chamilia, Kay Jeweler, Charmed Memories Bracelets and Many More! Thin Line® Charm Collection is a tangible symbol of love, support, honor, or remembrance, for all men and women in uniform and their families. We hope you will enjoy our heirloom quality products. The Thin Line® Charm Collection. Made by two hands, with lots of love sprinkled in. Shipped with a Keepsake Box. CARE INSTRUCTIONS: Exposure to certain harsh chemicals or environments will result in compromising the integrity of your jewelry. This includes, but is not limited to the following: perspiration, perfumes, cleaning agents, chlorine, salt water, and silver polish. Cleaning Your Jewelry: A silver polishing cloth is a great tool to make your sterling silver jewelry shine again. Do not soak in liquid silver cleaning solution! Thin Line® Charms are handcrafted. Please allow for minor variations. Thank you for supporting American Small Business! Love this charm. Very well made and fits my pandora bracelet perfectly! Very fast shipping too. Not thrilled? Returns should not be a hassle. Simply return to us within 30 days for a full refund less shipping. Returns must be in new, unused condition, and in original packaging. Unlike many other web sites that have special rules and lots of fine print, Thin Line® Jewelry offers affordable insured shipping on all domestic orders placed on our site, with no minimum order sizes or special exceptions. Just because shipping is affordable doesn't mean it should take a long time. Thin Line® Jewelry understands that getting your items quickly is important to you, so we make every effort to process your order quickly. When you order from our website via our standard shipping service (USPS Priority Mail), you can expect to receive your order within 2-7 business days. Delivery by USPS Priority Mail includes insurance for up to $100. In the case of a lost package, please submit a claim with USPS directly. International shipping: USPS First Class International service does not include insurance for lost packages and my not include customs fees. If lost package is a concern in your area, we recommend that you upgrade to USPS Priority International Mail. Thin Line® Jewelry is not responsible for lost packages or customs fees. In the case of a lost package, please submit a claim with USPS directly. Your order will typically ship on the same day if received before 2:00 pm Eastern, Monday through Friday. Please note: International orders may incur additional customs fees. The Thin Line® Charm Collection is only available on-line from Thin Line® Jewelry. Reproduction and manufacturing copyrights are solely owned by Thin Line® Jewelry, thus, our products are not licensed to other retailers, not sold in stores, through mail order houses, at fundraisers, or in lodges. If you have received a promotional e-mail for our products, or you see them offline, it is an attempt to unlawfully reproduce and market Thin Line® Jewelry copyrighted products. For authentic Thin Line® Jewelry, find us here, only on Etsy. Thank you for supporting an American owned and managed small business! Q: Is this an American Owned and Managed business? A: Thin Line® Jewelry is 100% American Owned and Managed. Do your charms fit the Pandora brand bracelet? 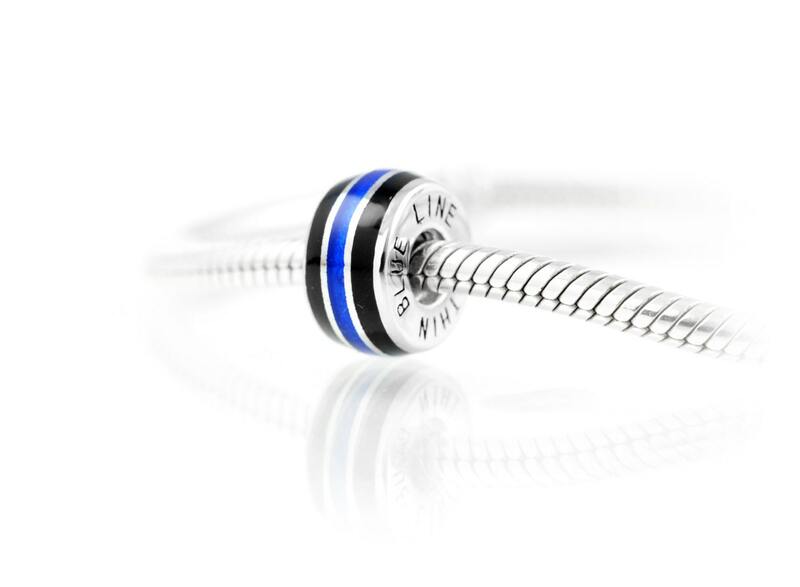 Yes, our charms have a high quality sterling silver threaded core and are designed to fit Pandora brand bracelets. Why is the silver core of my charm slightly gray? Occasionally, due to high humidity conditions, the silver will tarnish. To restore original luster we recommend polishing with a silver polishing cloth. Do not soak your charm in liquid silver solution! My charm is not perfectly round. What gives? Our charms are handcrafted in a 1500 degree flame from molten glass. It's a bit like wrapping toothpaste around a rod, but somehow we get it done. Please allow for minor imperfections. The line on my charm is not perfectly straight, or looks fatter or thinner than in the picture, or has a little blob where the line meets. Our charms are handcrafted in a 1500 degree flame from molten glass. It's a bit like wrapping toothpaste around a rod, but somehow we get it done. Each charm is slightly unique. Please allow for minor imperfections. What if something is wrong with my product and I am not satisfied? Please contact us so we can help. Since our goal is 100% customer satisfaction, we appreciate the opportunity to resolve any problems before feedback is left. We would never knowingly disappoint you! INTERNATIONAL ORDERS: Please note that your country may charge additional import/customs fees.